Fashion Herald: More "Why I Love Gap 34th Street"
It wins "best maternity department" award this week. I was just in there and there are many, many CUTE maternity dresses and jeans. I'll shoot them next week. The entire lower level is temporarily closed due to escalator face lifting, so all the women's is now with men's on the first floor. But still the store is very shoppable. I especially like that the usual men's sale section is the temporary women's sale section. Girls rule. Gap 34th Street takes initiative. 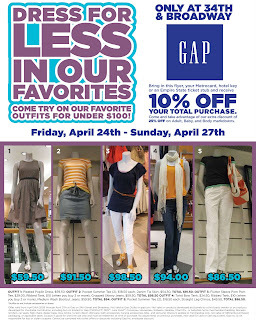 [updated flyer and info following] Bring in the flyer below, your Metrocard, hotel key, or Empire State Building ticket stub, and get 10% off your total purchase at Gap 34th Street. See below for details and restrictions. ONLY at the 34th & Broadway store. How I love those words. And as much as I adore stripes (#2), I want that poplin dress (#1). It's such a pretty blank canvas, and such a good basic to brighten with shoes, accessories, cardigan...oh you know what to do. This special promotion runs Friday through Sunday. Be sure to flash your Metrocard and get an extra 10% off, and look for the extra 25% off Adult, Baby, and Body markdowns. Hmm...shopping in the maternity section, do you have an announcement to make ;-) ? I'm with natanya ... anything you wanna tell us? natanya & sal - ummmmmm. soon all will be revealed!